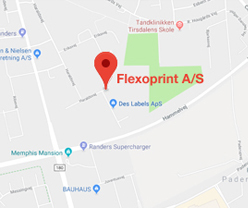 The FlexoPrint Group is one of the leading manufacturers of self-adhesive labels in Denmark for the labelling of FMCG and labels for logistics purposes. The group also supplies self-adhesive labels to the other Scandinavian countries and also has two subsidiaries in Germany, H&P Etiketten GmbH and the recently acquired TOM Etiketten GmbH, focusing on the German market. The customer base consists primarily of food and beverage manufacturers, major retail chains and label distributors. The company is headquartered in Randers, and the Group employs just over 100 employees. The group has production facilities in Randers, as well as in Salzbergen and Greven, Germany. DES Labels ApS, and the 50% owned TJ Partner – Tryk I/S is also a part of the Group. At FlexoPrint AS, we view the cooperation between customer and supplier as more than just a business relationship. The cooperation is based on respect, product knowledge, insight, and mutual understanding—therefore we literally view our customers as partners. A partnership requires reciprocity and loyalty—that the partners prioritize the same results and work toward the same goals, and agree that one cannot cut corners to reach the optimal quality. This is exactly how we feel with our partners, and we see it as our job to contribute to the development of our customers’ businesses.